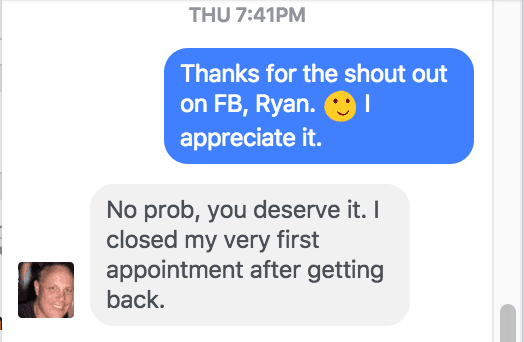 I just left my very first appointment since your training a while back and closed the deal on the first visit! Your training helped me tremendously and owe this one to you buddy! All of your materials provide me a good conversion path to close this deal affectively. You would have been proud to be a fly on the wall on for this deal, all of your steps where covered!!! John the first thing on my list to do today is say THANK YOU!!!! Your training has been invaluable. 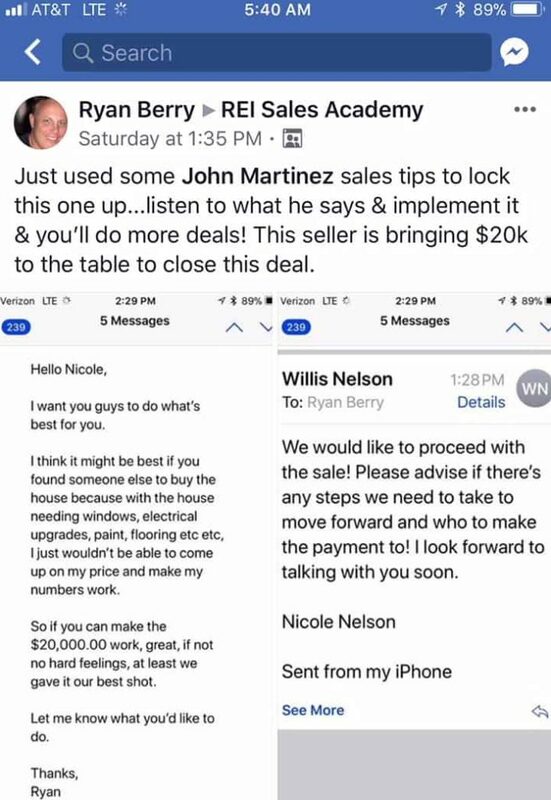 Yesterday we were hoping to renegotiate $5000 off a deal and thought we would be rockstars if we could renegotiate $7,000. 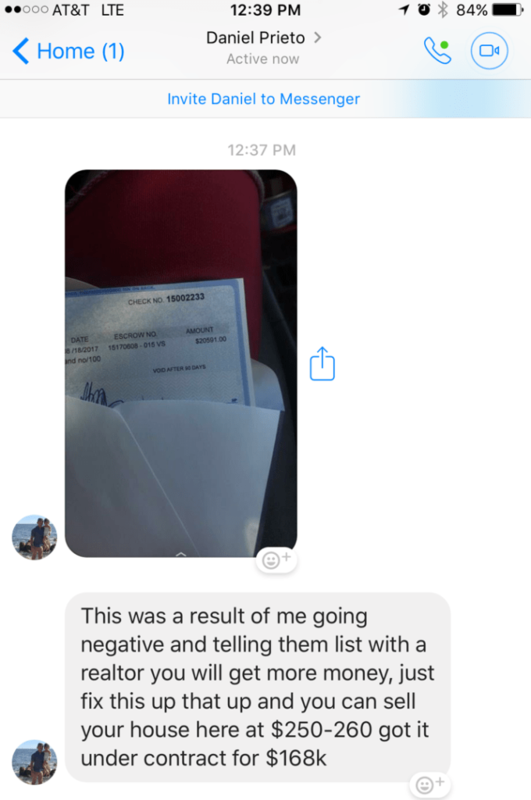 Well.......... after being visibly uncomfortable, breaking the bad news, letting them out of the deal and dropping our number hint, THEY OFFERED TO COME DOWN $10,000 without us ever asking - JUST LIKE YOU SAID!!!! 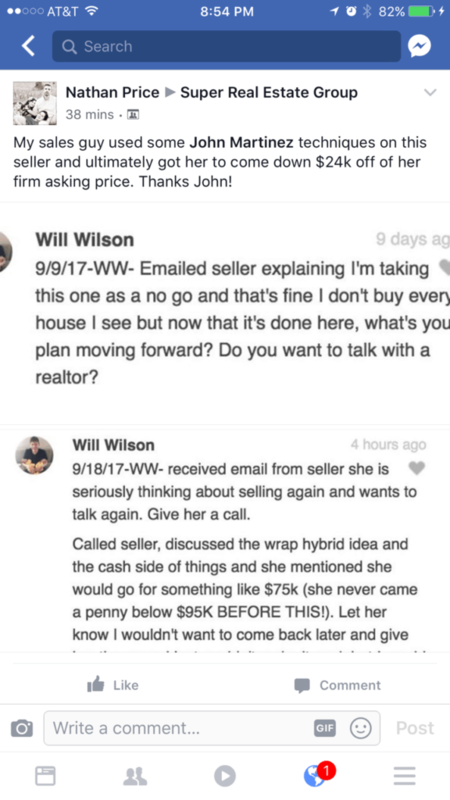 I never thought I would see the day a seller would hand me an extra $10,000 over a conversation but THERE IS POWER IN THE PROCESS! 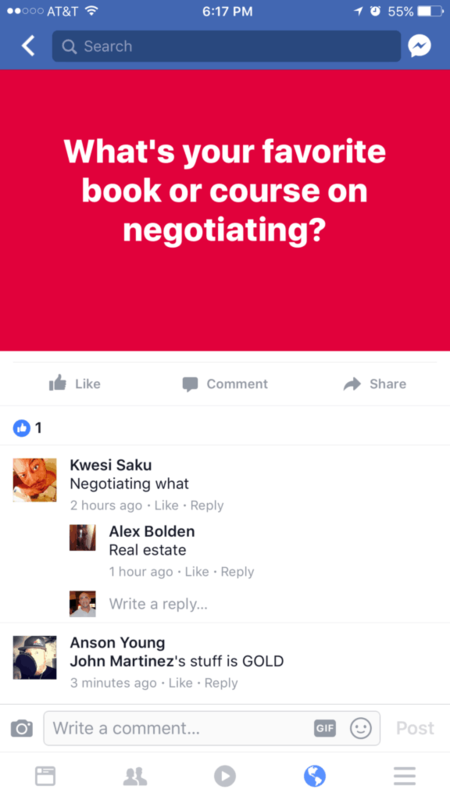 I wanted to see if my renegotiation experience the other day was just a coincidence or really worked so I decided to do it on another deal. We were in the deal at 110 and our goal was to see how far they would come down. We followed the process to the letter and they came down.............. way down. They suggested we pay them 90 for it. THEY SUGGESTED IT!! AND the sellers loved us for it because we were following them. That's $30,000 in renegotiations this week on just the 2 deals. I'm going to have to bridle myself and use this thing responsibly because it is addicting. 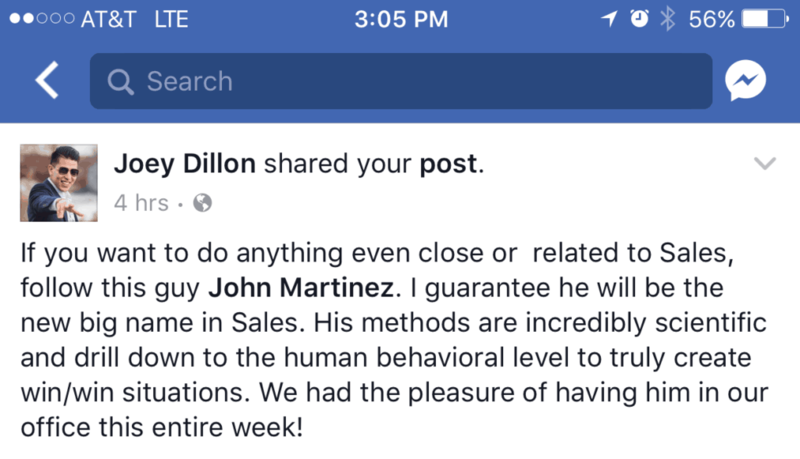 John Martinez you are the man!!! I still keep all of my notes in front of me before during a sales call and I use the sales review sheet to ensure I’m hitting all the stops. 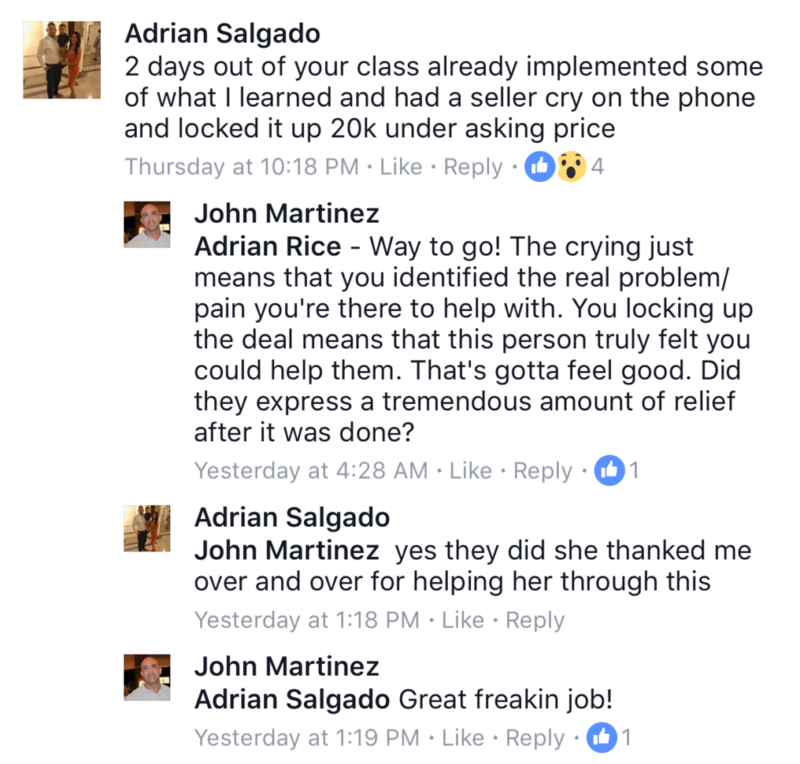 John Martinez your training probably made me 20k today. I had a verbal agreement with the seller on the phone and emailed them the purchase agreement. They then emailed me that they needed to meet with a realtor friend on Thursday before deciding. 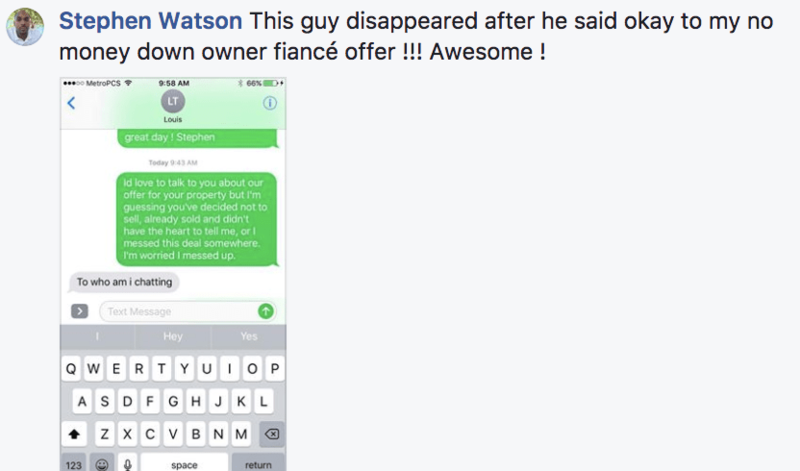 I replied [the way you taught], and an hour later they called back saying they'd take my offer!!!! Thank you John. I know you know your stuff works but wanted to share anyways. 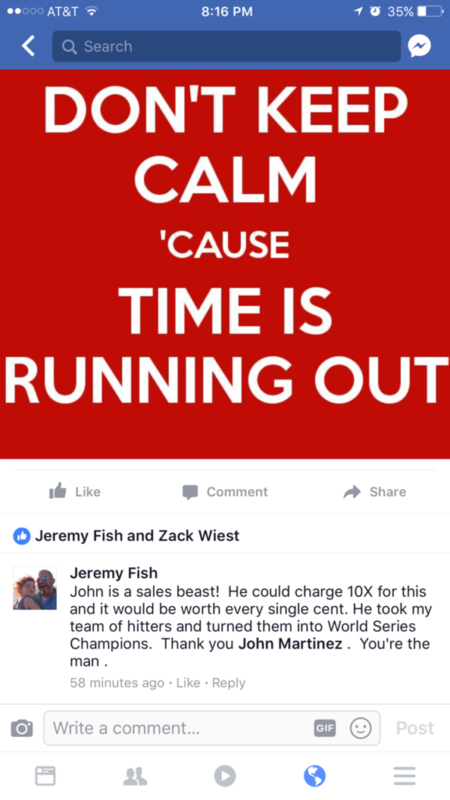 I just used this template on a seller who dropped off the face of the earth...got a response back in 2 minutes. Lol! Hardest part.....coming up with the ice breaker for point 1)! Love your work, the REI training & materials are just awesome. 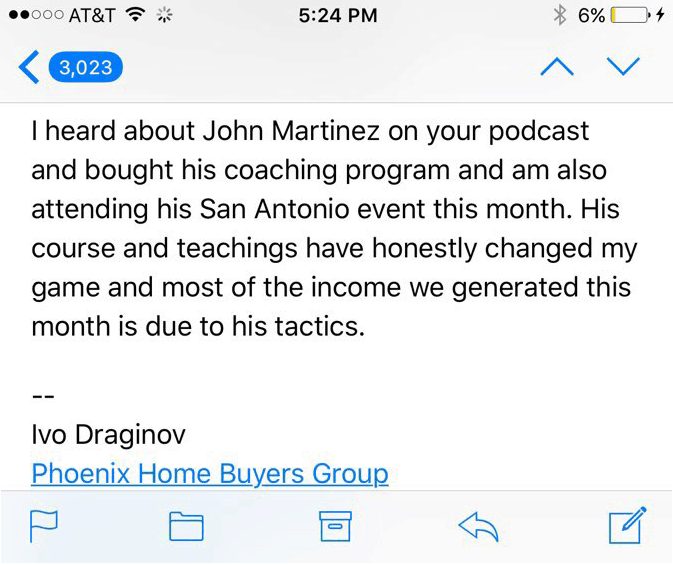 I think I've endorsed John Martinez on here before, but just wanted to again. He added a TON of value to our sales team as our coach. We are now holding our sales reps accountable to a systemized sales process that we can track and improve upon. 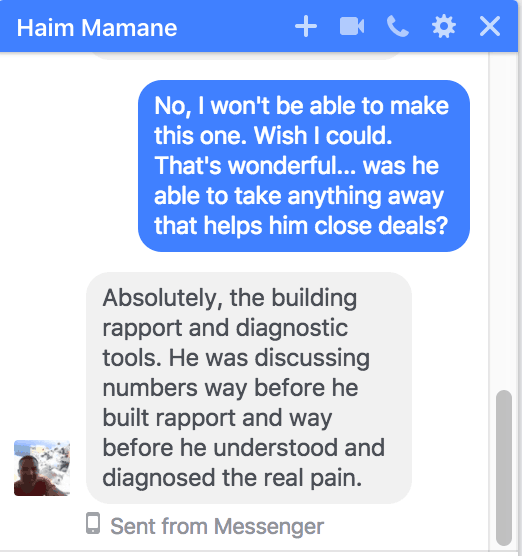 Furthermore, I know of several specific deals we locked up that we otherwise would have lost, by using negotiation tactics that he taught us (like "going for the no"). That's tangible money gained right there. Much more than it cost to hire him. 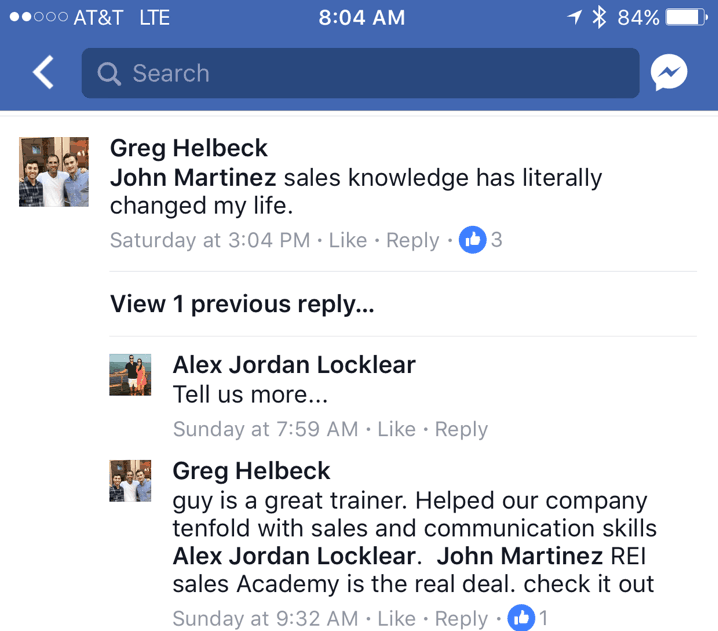 If you're considering hiring a sales coach, look no further! If you're on the fence, consider how much money you spend on marketing each month to generate new leads. 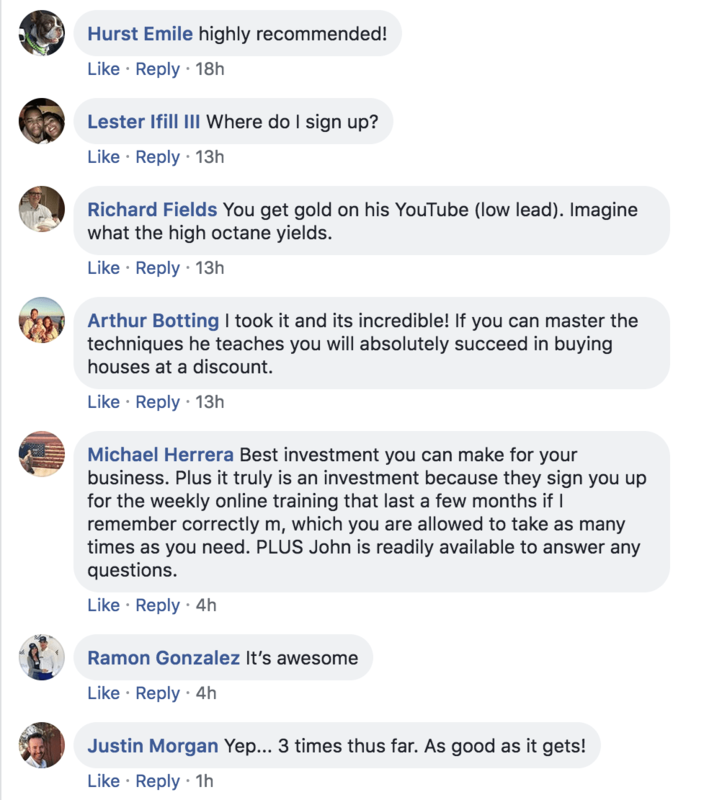 If you trim off a fraction of that money and apply it to CONVERTING those leads at a higher rate, you end up with more bang for your buck overall. John I just have to say the tactic you taught last week about apologizing for doing something works so well it should be illegal. 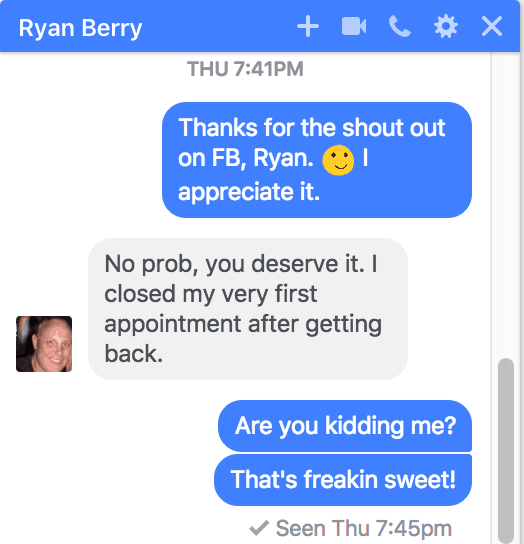 My brand new lead managers are getting responses from people that have ignored calls and texts for months! 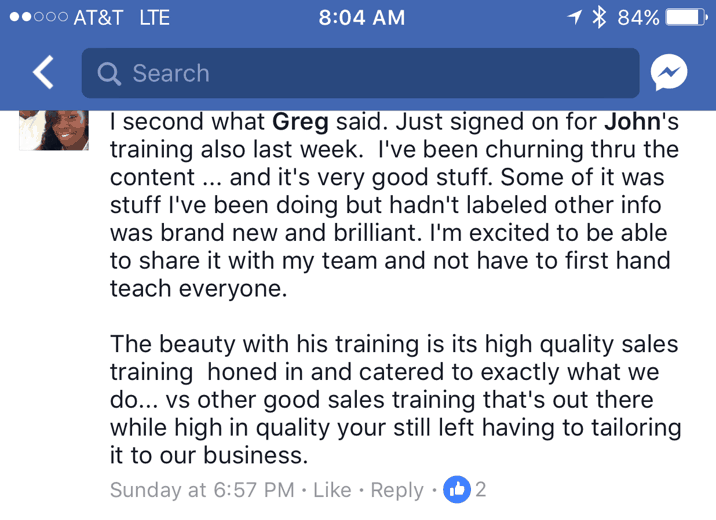 Just wanted to thank you for the awesome training. It's making a big difference in my business. We got one and closed. Still kinda in shock....We still have things to work out in office but our deals are getting better and better.....and getting clarity with stuff. Let me know if you need anything !!! Thanks again for all you do, Have done, and continue to do!!!! Talk soon And again "THANK YOU SIR!!" Great session today with John Martinez! 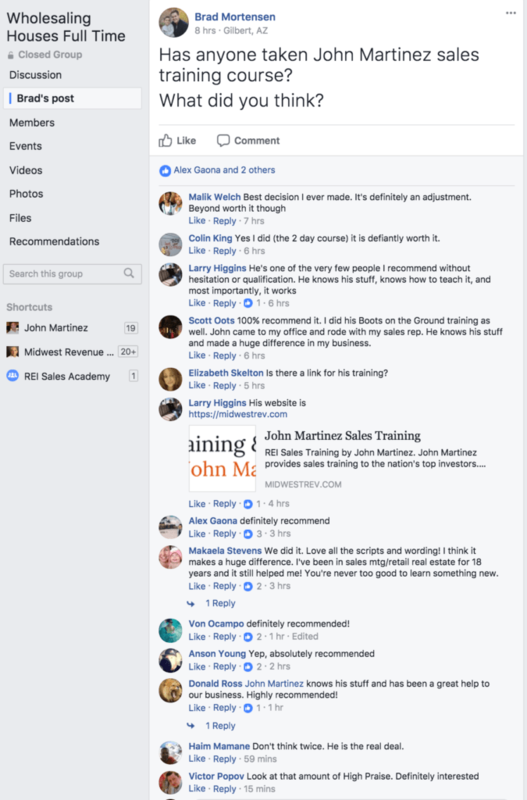 If you are not using John you NEED to be! Next level stuff for sure! Get in touch with John Martinez. We trained with him and its great stuff that’s based on science and systematic methodology. It’s been great for our acquisitions guys. John Martinez is that guy. 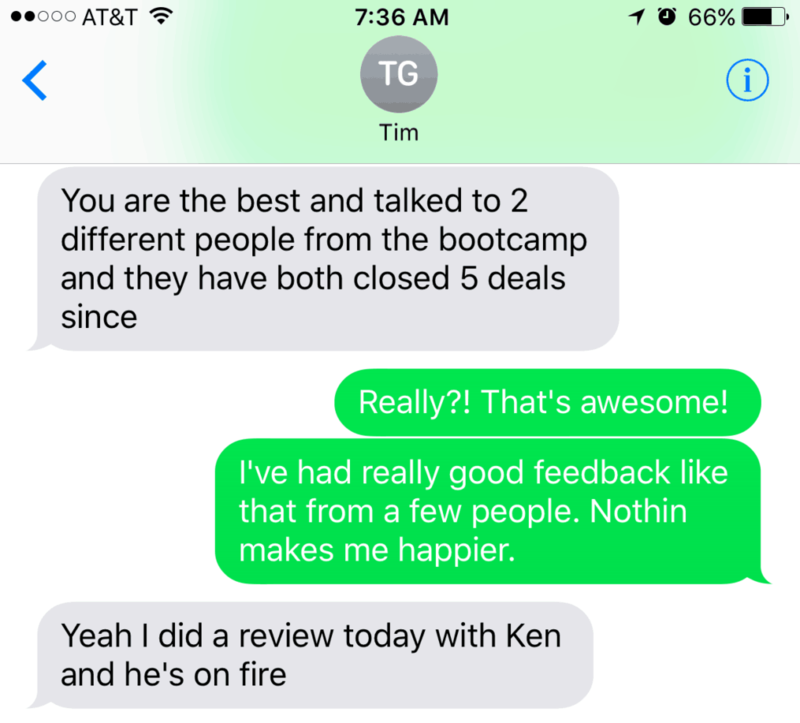 You train them [your salespeople] on the product, contracts, and other procedures. 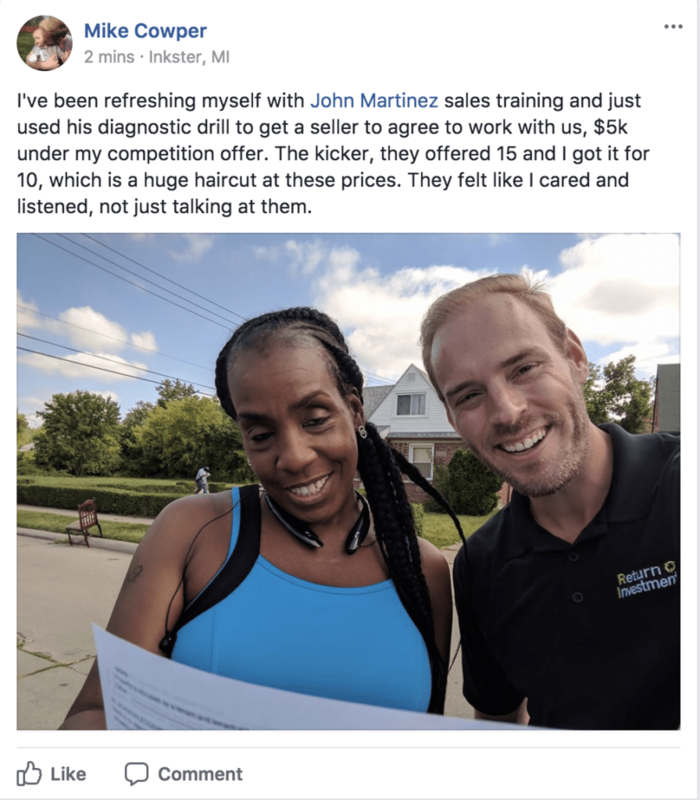 John will show them how to sell like a pro. 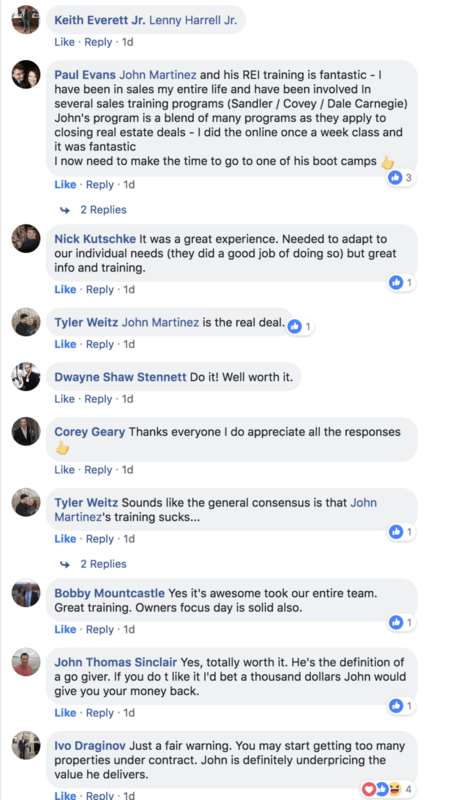 The training has been wonderful and exceeded our expectations. We reaped a lot out of it and have recommended you to several people already. I appreciate everything and look forward to doing more with you. 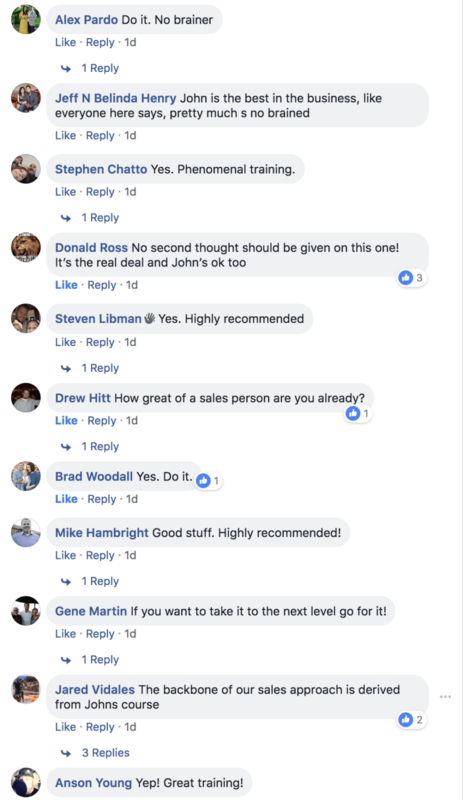 John, I want to thank you for your, experience, and knowledge in the important area of sales. I have found your sessions both interesting as well executable. 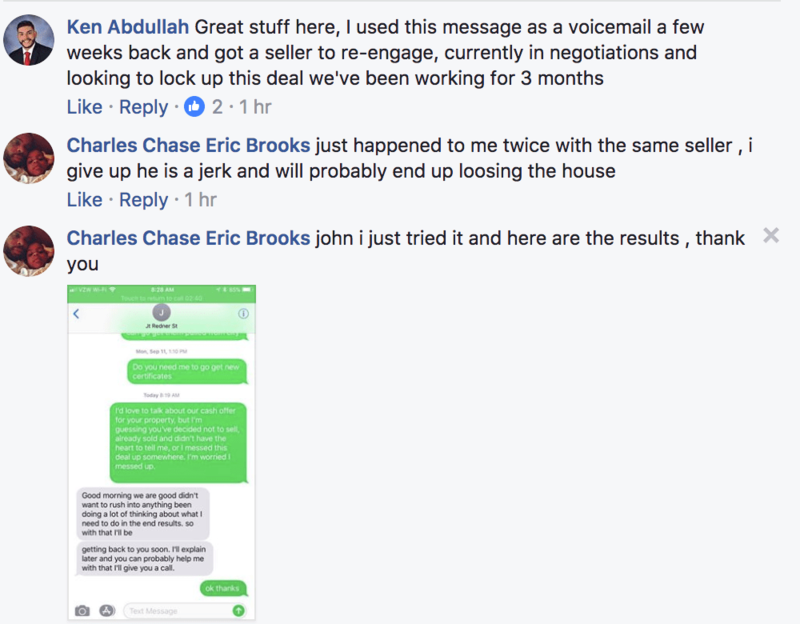 In fact, I had a call immediately after last week’s call with a seller. I used the techniques you have trained us on to a good outcome. I am now a major set forward in acquiring his property in a very win-win manner. I wanted to chime in and give my feedback on the course after several weeks into it. John's material has been very beneficial to our sales guys. We have our acquisition guys, our disposition employee, as well as our business development managers for our management company. 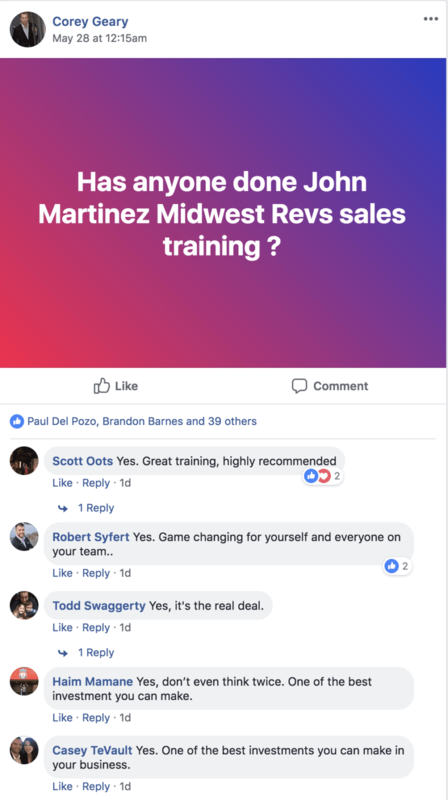 They have all benefited greatly from the weekly trainings as what he teaches relates to all sales and applicable to all types of sales positions. Our newest employees with less sales experience have benefited the most. 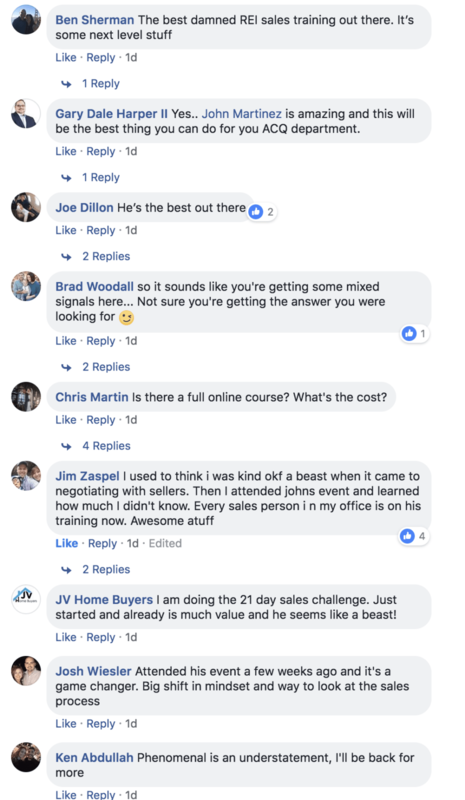 We started around a month ago with John and we are having our largest acquisition month at 16 deals so far for this month. John is the real deal. Been super impressed with the content he provides and the way he delivers it. I'd highly recommend him to folks.